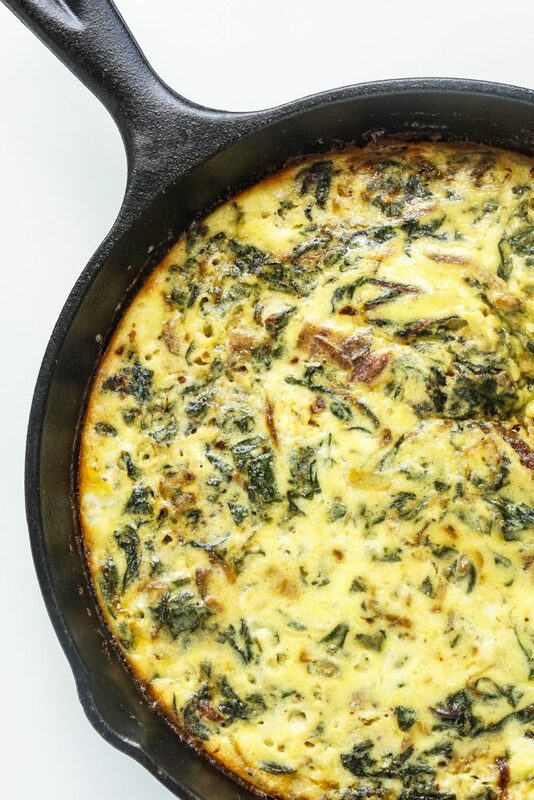 This keto frittata recipe is a major throwback. You see, I learned to cook on Sundays. My family’s restaurant closed every Sunday, and we would all flock there for brunch after church. Once a week, the buzz of customer chatter and clinking utensils was replaced by children’s squeals and giggles as my siblings and cousins played hide-and-seek in the nooks and crannies of the empty dining rooms. Much older than the rest of the bunch, I knew all the best hiding places and could quickly seek out the hiders. Devoid of a challenge, the game lost its allure, and I gravitated towards the kitchen instead. Grandpa coached me through all the egg dishes and techniques: fried, scrambled, poached, omelets, hard-boiled, soft-boiled – you name it. The little ones would always stick their tongue out at the quiches and frittatas we’d whip up, preferring scrambled eggs or French toast instead. But those baked egg dishes struck a note with me, which Grandpa assured was the ultimate sign of maturity and refined palate. 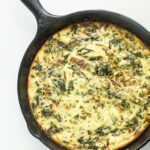 This keto frittata recipe with ricotta and bacon reminds me of our family diner and Sunday cooking with Grandpa. Such good memories; nostalgia is setting in! There’s just something so comforting in food from your childhood. To this day, the frittata is one of my favorite breakfast fares. The creamy, custardy texture is heavenly, and the flavor combinations are endless. It’s a great meal to make for entertaining a large group of friends or family but can easily cover a stretch of breakfasts for the week if you’re only cooking for one or two. 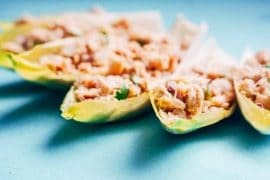 Keto frittata is genuinely a meal prepper’s dream come true! I often find myself using random ingredients in the fridge to experiment with new flavors and make use of leftovers. 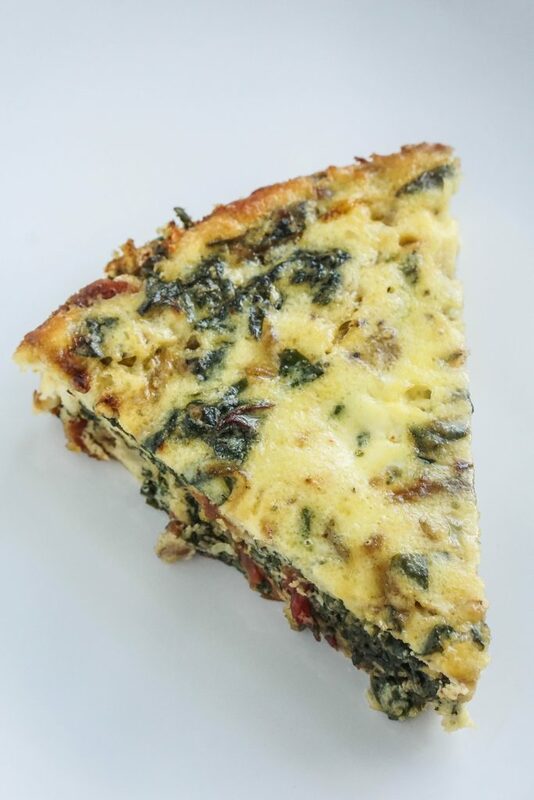 Whatever ingredients you decide to use for your keto frittata, make sure they are low in carbs and take care to cook them before adding the egg mixture. The keto frittata I’ve prepared here consists of bacon, caramelized onion, red chard, ricotta cheese, and a teensy bit of Parmesan. After frying the bacon, cook the onion and red chard in the bacon fat and season with salt, pepper, and red chili flakes. If you don’t have red chard available, spinach would be an excellent substitute. Beat your eggs with heavy cream and season with salt and pepper – don’t wait to season after they bake or only the top of the eggs will taste the way you like it! 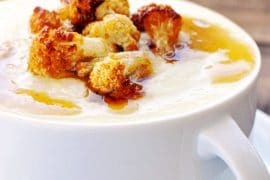 If you’re looking for other keto vegetables to include, be sure to check out my guide to low carb veggies. Gently fold in the ricotta and Parmesan with beaten eggs until the mixture appears a bit lumpy. Stop mixing before the egg mixture is completely smooth! If you leave lumps of ricotta, you’ll discover beautiful gooey compartments of cheese as you eat (you’re welcome). Pour that cheesy egg mixture over the veggies and meat, and then bake in cast iron for the best results. 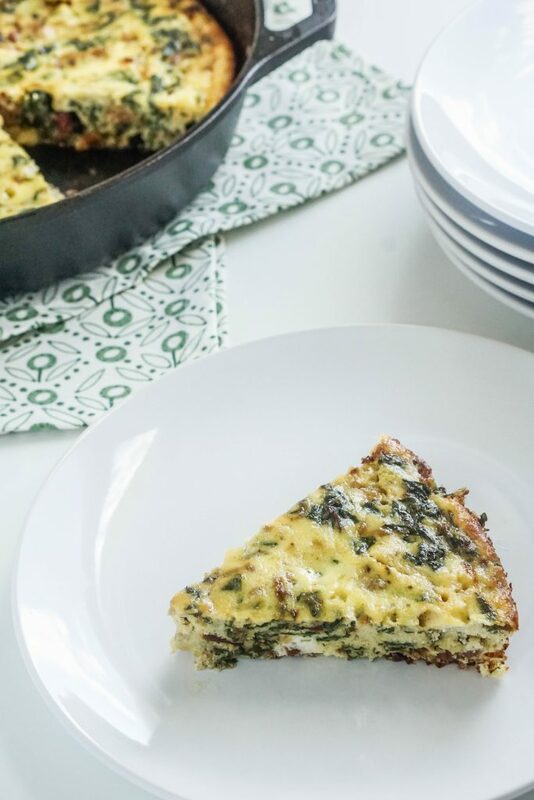 Now that this low carb keto frittata with ricotta has me feeling incredibly nostalgic, I’m dying to know what your favorite childhood dishes are! Let me know in the comments below! 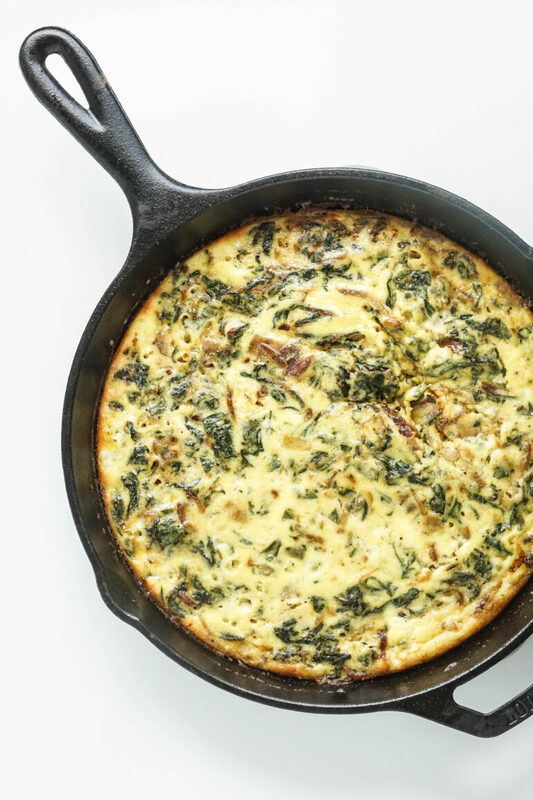 If a bacon keto frittata doesn’t sound like your thing, try this sausage frittata recipe instead! If dairy is an issue, this dairy-free frittata looks promising! Get your meal prep on point with this ricotta frittata! 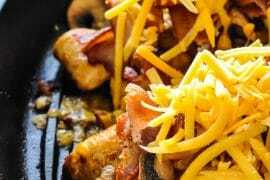 Fry up bacon in a well seasoned 10-inch cast-iron pan over low-medium heat until it is thoroughly cooked, but not quite crispy, about 8-10 minutes. Once the bacon is cooked, transfer out of the pan and chop into 1cm chunks. Reserve the pan for baking the frittata. Using the fat rendered from the bacon, grease a large saute pan and cook the onion over medium heat until it becomes translucent. Add red chard to the pan. Toss and stir to coat the leaves in bacon fat and cook for 2-3 minutes. Season the onion and red chard with salt, pepper, and red chili flakes. Stir in bacon and transfer to the cast-iron pan. 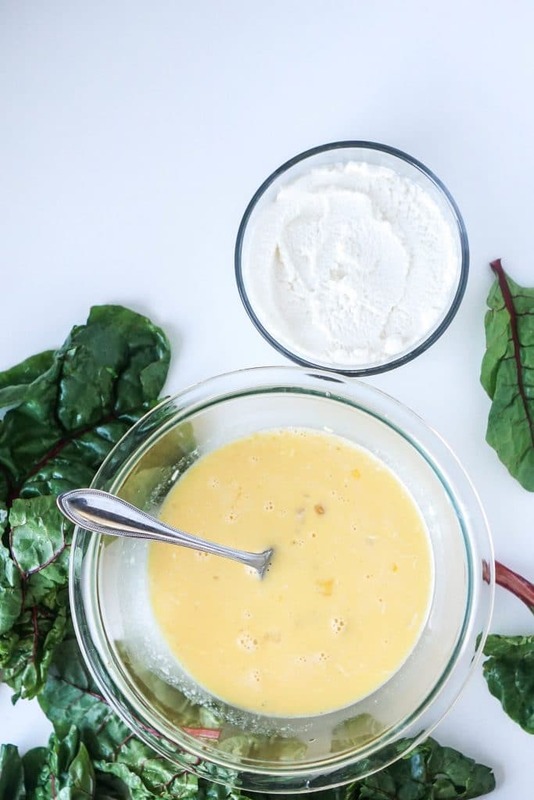 Beat eggs and heavy cream together in a medium mixing bowl. Season with salt and pepper. Fold the ricotta and Parmesan cheese into the beaten eggs. 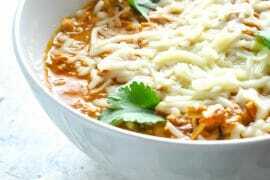 Slowly mix until the mixture appears lumpy and stop before the cheese is completely blended in. Pour the egg mixture over the bacon and vegetables in the cast-iron pan. Stir to evenly distribute the ingredients throughout the eggs. Bake for 20 minutes. 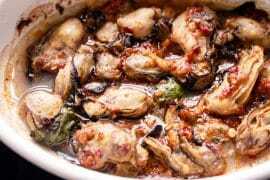 For the last 1-2 minutes, switch on the broiler of the oven to develop a light golden color on top. Remove from heat and let cool for at least 10 minutes prior to serving. This frittata looks heavenly! I totally need to try it. My favorite childhood dish was definitely eggs in any form, too. My mom made them with tomatoes and caramelized onions. The dish is different, but thanks for bringing back those memories! Anything with caramelized onions is pure bliss! That sounds amazing! I just made this and it’s awesome! And easy. I did tweak it a bit, using only one skillet, pouring out half the bacon grease then cooking the onions, etc. in the same skillet. I also subbed shredded mozzarella cheese for the parmesan and added one chopped red mini pepper. One slice was satisfying and leaves me more carbs for the rest of the day. Thank you, Tasha!